Shaunae Miller-Uibo won a much-anticipated clash against Dina Asher-Smith in the Diamond League at the Alexander Stadium on Saturday. The 24-year-old from the Bahamas cut a striking figure with her pink and purple hair and she pulled away from the recently-crowned European champion in the home straight to clock a meeting record of 22.15 to Asher-Smith’s 22.31. Four months ago, Miller-Uibo beat Asher-Smith into third at the Commonwealth Games and in Birmingham the Olympic 400m champion again emerged victorious. 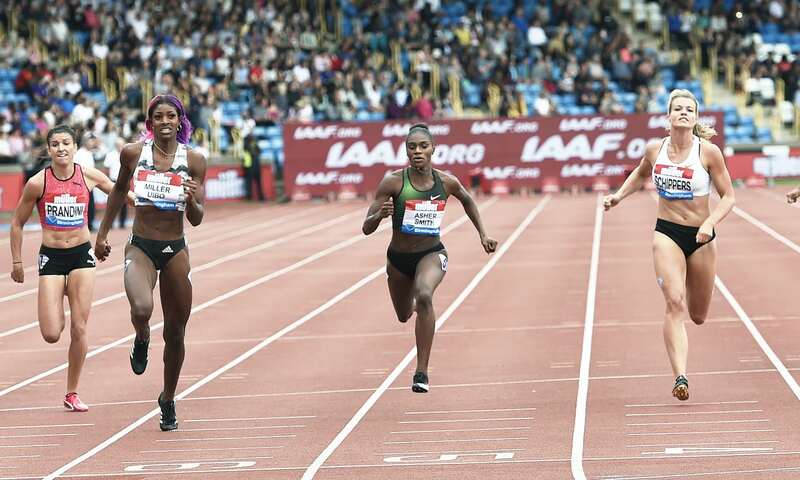 Asher-Smith, who broke UK 100m and 200m records in Berlin last week as she won three European titles, ran a great first 100m but the Bahamian was too strong in the second half of the race as Dafne Schippers ran 22.41 in third and Shericka Jackson 22.55 in fourth. Elsewhere in the women’s events in Birmingham, Laura Muir’s tilt at Kelly Holmes’ UK record for 1000m fell a little flat as the European 1500m champion clocked 2:33.92 in gusty, overcast conditions to miss Holmes’ 2:32.55 mark. Given that Muir has run quicker, with 2:31.93, indoors in the past, many assumed the record would be a formality. But the early pace of 30.9 at 200m, 60.7 at 400m, 91.5 at 600m and 2:03.0 left Muir with a little too much to do. 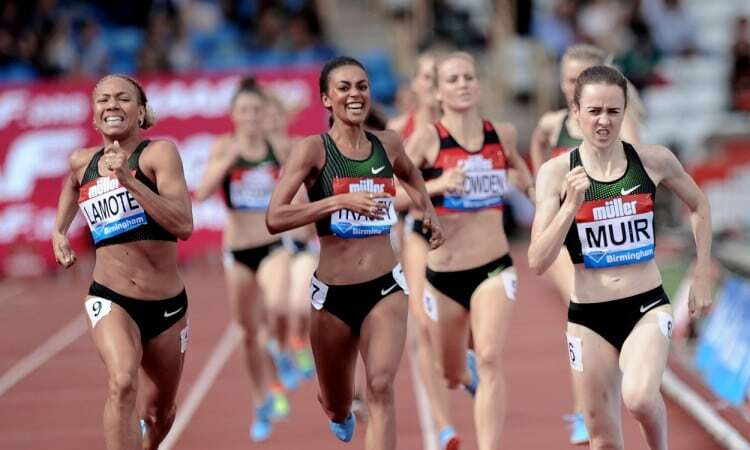 Still, Muir beat the European 800m runner-up, Renelle Lamote of France, into second, as fellow Brits Adelle Tracey and Katie Snowden finished third and fourth. Caster Semenya was among several athletes to drop out on the eve of the meeting and certainly would have featured in the women’s 1500m, although she would have had to have been on the top of her game to beat Sifan Hassan. A few days after her European 5000m victory in Berlin, the Dutch athlete began slowly but was well placed at the bell and outkicked Gudaf Tsegay of Ethiopia to win in 4:00.60. Behind, Sarah McDonald’s fine late-season form continued as the 25-year-old Birchfield Harrier ran a strong last lap to take more than a second off her PB with 4:03.17 in fifth. The 3000m saw a Kenyan 1-2-3 as Agnes Tirop ran 8:32.21 to outkick Lilian Rengeruk and Hellen Obiri. In fourth, Eilish McColgan was leading Brit with 8:38.49 as Melissa Courtney clocked a Welsh record 8:39.20 one place behind and Steph Twell ran a season’s best 8:46.79 in 11th. European champion Malaika Mihambo took long jump victory with 6.96m but the German had to work hard to hold off the challenge of triple jump specialist Caterine Ibarguen. The Colombian, who enjoyed a 34-meeting win-streak in the triple jump during 2015 and 2016, leapt 6.80m but Mihambo jumped 6.82m in the fourth round before improving to 6.96m in the sixth and final round. Brits filled the following three places but they couldn’t repeat their performances from the memorable British Championships earlier this summer. Shara Proctor led the way with 6.70m for third place, closely followed by Lorraine Ugen, the British champion jumping 6.69m, then Jazmin Sawyers with 6.67m. Commonwealth champion Christabel Nettey of Canada was sixth with 6.54m as Katarina Johnson-Thompson leapt 6.41m in seventh. Runner-up Katerina Stefanidi of Greece cleared 4.52m, but there were disappointments for several other vaulters – Britain’s Holly Bradshaw was fifth with 4.40m, while neither Yarisley Silva, the 2015 world champion from Cuba, or New Zealand’s Eliza McCartney, who has a 2018 best of 4.94m this year, managed to clear a height. In the 400m hurdles the European champion Lea Sprunger beat Commonwealth champion Janieve Russell with 54.86 as Britain’s Meghan Beesley was third with 55.83. The women’s sprint hurdles saw a German one-two as Pamela Dutkiewicz took the win in 12.84 (-0.6) from Cindy Roleder (12.96) with Brits Alicia Barrett and Cindy Ofili – the latter on the comeback trail from injury – finishing fifth and sixth in 13.56 and 13.58. There was further success for Germany in the shot put as Christina Schwanitz of Germany took victory with 18.20m as she beat the European champion Paulina Guba – the Pole throwing 17.92m.